This interview was taken and translated from s.163.com. At Blizzard's 20th anniversary, game.163.com sent out an interview team to interview some of the executives and leaders of Blizzard. The following is the interview between the team and Dustin Browder, the Leader Designer of Starcraft 2 at Blizzard. This first part of the interview was conducted on 27 April. Thank you Mister Dustin for this exclusive interview with game.163.com. As we all know, Starcraft 2 is a competitive game, an eSport. As a result, balance is especially important. However, some of the top players from Korea, like Nestea and fruitdealer, complain that the Zerg race is very weak. What does Blizzard have to say about this? Dustin : There is a chance they might be right, but most of the time, our views on balance have to be supported by data, As of now, from the data that we have, we are unable to support the view that the Zerg race is very weak. In the Grandmaster Leagues and Master Leagues of the various battlenet regions in the world, the win ratios of all 3 races are between 50-55%. If we look at any one region, Protoss might be the top race one week, but they could also very well be overtaken by Terran the following week. These patterns might also show up differently in different regions. Therefore, based on the data that we have, we do not agree that there is a problem with the balance of the game. Furthermore, you have to understand that the players of the different races are saying different things about the situation. Terran players are also complaining that Terran is hard to play. Similarly, Protoss players are also complaining about their own race. We do not acknowledge that there are signs of imbalance in the game. Our view is that the balance situation in the game is quite good as of now. Apart from balance, the situation where one unit counters another unit is quite serious. This makes it very hard to stage a comeback in games. In Starcraft 1, players could make comebacks through the use of various strategies or through some other means. However, it is very difficult to do make combacks in Starcraft 2. What do you think about this issue? Dustin : That is actually not the case. This situation where one unit counters another unit is not as serious as it was in Starcraft 1. Let's say we have a templar fighting a zergling, and the templar always loses. That's a situation where we really see one unit countering another unit. As of now, the balance between unit-counters and micro is better than in Starcraft 1. I've watched quite a number of tournaments. We have lots of situations where player A wins the first game, and player B comes back to win the second game. Within the games themselves, we also see the advantage keep swinging from one player to another. This shows that the state of Starcraft 2 is not that one sided. Perhaps, the situation in these tournaments are not completely accurate, but from what I see now in the top tournaments, unit counters are actually quite relative. For example, let's look at a situation where we have banelings fighting against marines. If they were to just clash against each other without any micro, the banelings will definitely kill off a lot of marines. However, if the marines have stim, I believe you can use micro to come out ahead in the engagement. Let's look at another situation, where we have banshees against marines. In a straight up fight, the marines will definitely win the fight. Yet, if the banshee has cloak, the situation would be different. Let's look at yet another situation, marauders against stalkers. If both sides a-move, clearly the marauder will win. However, if the stalker has blink, and uses blink well, the situation might turn out different as well. Regarding Blizzard All-Stars, can Blizzard reveal any more details about it? Dustin : (Dustin starts laughing at the mention of All-Stars) As of now, we are unable to reveal anything more. There is a lot of balancing we need to do, and a lot of details that we are still working on. In addition to carrying the name of Blizzard, this map also carries with it the name of DOTA, and because of that, we will definitely remain true to our reputation. Until we feel that the map is perfect enough, we won't be revealing any information about it. What I can reveal though, is that we are in the process of fleshing out the details and contents, as well as testing the balance of the map. Does Blizzard have any future plans regarding custom maps and ladder maps? Dustin : As far as custom maps go, it will just be the few that we have for now. For ladder maps however, the plan is that every season will have new maps, and each season will last for about 3 months. For example, we released quite a number of maps for 1v1 for season 2 which just started. In that case, we might release more 3v3 or 4v4 maps in season 3. The more popular maps will then be kept in the map pool. Taking another example, there is also a possibility we might see some maps from season 3 reappearing in season 7 or something like that. Chinese players are grumbling that they are unable to buy a full retail copy (T/N : They have to pay a montly fee to "rent" the game), and Asian players are grumbling that they are unable to get a Collector's Edition of the game. Are there plans to release the Collector's Edition in Asia when Heart of the Swarm comes out? Dustin : Firstly, I'm not the right person to answer this question. Someone from the marketing or sales department would probably be able to answer this question more accurately. Furthermore, we are unable to reveal much regarding this, but we can assure you that we are looking into this problem and listening to the views of the players. We are very open and receptive to the comments by the players, and we are going to start looking into the situation regarding this issue. Is Blizzard going to add a clan system into battlenet? If there is going to be a clan system, what benefits can we expect from it? Dustin : We have heard about this idea, and it is definitely something we want to do. Perhaps, players would be able to have their clan tag in their names while playing, or we might be able to have clan wars. However, we do not have a specific plan or timing to go into this, and we are unable to give you any specific details. Only one thing can be sure, that this is the direction we want to head towards in the future. One final question. Starcraft 2 has amazing CG. Can it be made into a movie? Dustin : We are happy and proud to be able to hear such good comments about it, but I do not know of any plans to do that. In the end, we are still a game company. There is about 40 minutes of CG in Wings of Liberty, and that already took up quite a substantial amount of time. That being said, we will be putting in even more effort in producing the CG for Heart of the Swarm. This is the second part of the interview, conducted on 28 April. Thank you Mister Dustin for this exclusive interview from game.163.com. The topic on everyone's mind has much to do with Heart of the Swarm. Blizzard is going to release part of the storymode of Heart of the Swarm for testing in May. Are you able to reveal any new elements or details or contents in Heart of the Swarm now? Dustin : We are currently working very hard in creating Heart of the Swarm, but as of now, there is no confirmed information that we can give you. The only thing we can say is that Heart of the Swarm will differ from Wings of Liberty in many many different areas. Much of Heart of the Swarm will be talking about the story of Sarah Kerrigan, and many things will be happening to her, and she might be attacked quite a number of times too. Wow. That's not a good thing for Sarah Kerrigan fans! Dustin : Haha, I guess you could say that. However, it allows the story and the character of Sarah Kerrigan to be more fully developed. In the website for Blizzcon this year, Sarah Kerrigan appears in a "purified" state. Will she be appearing in this state in Heart of the Swarm? Dustin : She's changed a lot. You should know if you've played Wings of Liberty before. At the end of Wings of Liberty, she underwent many changes due to the artifact. Her character and how she appears will undergo many changes, and we might see many different versions of Sarah Kerrigan. However, the final image can only be finalised and confirmed at the release of Heart of the Swarm. This year, Polo went to Korea to deal with the issue of intellectual property rights with Kespa. As a result, both parties entered into a lawsuit. After that, GomTV chose to return their rights for Starcraft 1 to Blizzard. Does this mean that Blizzard will continue to maintain this attitude with regards to intellectual property right? Dustin : Yes. In fact, I specifically went to Korea to deal with the intellectual property rights of Starcraft 1. There's one thing I want to say here. GomTV and Blizzard has a very tight and solid relationship. Both parties will do their best to create a top environment for Starcraft 2 as an eSport. Even though Starcraft 1 is still going on, we will still be placing more emphasis on Starcraft 2. This will be our main focus from here on. Finally, can you say something to the players in China? 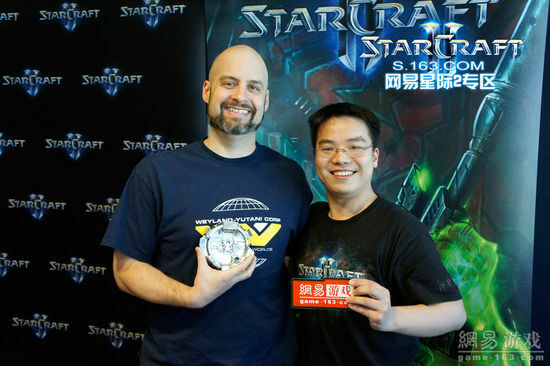 I hope the Chinese players will continue to support Starcraft 2, and continue giving us their support and feedback. If you see anything that can be improved with this translation, or any comments or corrections about it, please feel free to let me know. we will be putting in even more effort in producing the CG for Heart of the Swarm. As of now, the balance between unit-counters and micro is better than in Starcraft 1. ... erm... ya... you serious? also looks like no clan support till expansion or whatever.. This situation where one unit counters another unit is not as serious as it was in Starcraft 1. Let's say we have a templar fighting a zergling, and the templar always loses. That's a situation where we really see one unit countering another unit. As of now, the balance between unit-counters and micro is better than in Starcraft 1. If he honestly believes this... There is no way I am getting Heart of the Swarm. The Templar vs Zergling analogy is so ridiculous and out of place I just don't even know what to say. Comparing a T1 unit to a T3 caster? You can use the same example in SC2 and get the same outcome. What the hell. His Banshee vs Marines example is equally bad. Using cloak is 'micro'? It's just an ability. If he had have said "with good banshee control you can overcome any number of marines" it would have made sense. It's honestly scary that he still doesn't understand what micro actually is. Thanks for the translation, this interview is one of the better ones. It was such a good question (regarding the difficulty of staging a comeback), but Browder just dances around it by talking about micro. Disappointing. It scares me a little that they won't address this major issue. Chinese players are grumbling that they are unable to buy a full retail copy (T/N : They have to pay a montly fee "rent" the game), and Asian players are grumbling that they are unable to get a Collector's Edition of the game. Are there plans to release the Collector's Edition in Asia when Heart of the Swarm comes out? We do not acknowledge that there are signs of imbalance in the game. Our view is that the balance situation in the game is quite good as of now. Haha you might want to note that that question/answer was particularly difficult to translate, so there might be some problems with the translation. What, did you actually expect him to acknowledge his team's shortcomings when it was brought up in an interview? I think hes right...any imbalance can be removed by figuring out how to sidestep them.If you can't then there is seriously something wrong and they need to patch that. Uhoh Zerg QQ incoming. Nothing really surprising in there. Is that the first confirmation of ~3months per ladder season? I thought first "well he's a game designer not the balance guru" then thought about that for about a minute until I realized how retarded that was. This guy basically designed the game but can't even make a semi-decent comparison between two units? Not that it matters as what he says is bullocks. Units hard counter too much in SC2 compared to SC1 and he have no answer to why that is and doesn't want to understand. It looks like you did a good job. The interviewer's had some really great questions too. I wish other interviewers asked questions like those. They always end up being something pointless like "When will we get more achievements?" Some of the answers are just so disappointing to read though. Agreed, I wanted to just quote that and say "WAT". I feel like a lot of people have pointed out in SC1 you could win a game against a inferior opponent with the crappiest army composition but in SC2 if you make the wrong composition and/or your opponent has the just right composition there's very little you could do to win the battle or game. That's been my experience too at least. Bring back Rob Pardo tbh. We know there are some issues with some units being too much of a hard counter to others. We are working hard on making micro more rewarding for players for Heart of the Swarm. Banelings vs Marines are a good example of what we want to aim for. The team is also fine with Zerglings being able to kill High Templars and will not be making any adjustments here. I would have been pretty happy with that response. It has harder unit counters than BW for sure. Vultures vs Dragoons anyone? Imho the major issue is that people seem to think there is a major issue here. At every stage of SC2s lifespan there have been development through playerskill. Every day. Yet at every point in time there are people with the strong belief that there are "major issues" that must be solved through changes in the actual game. If you compare to just a couple of months ago how there was big battles and then GG, to how it looks now with tenious harass and quite often comebacks. The question was answered very well. Unit counters are alot stronger in SC1, but yet people percieve SC2 unit "counters" are extremly strong. The longer we'll play this game the looser this term will be for sure, as it did in BW.